Another week and we're still eating healthy here. Woo-hoo, very proud of ourselves! This week I decided to try my hand at mushroom barley soup, but instead of heading out to the store to buy vegetable stock, I made my own. Stock is crazy simple. Throw a bunch of veggies into a pot with a lot of water, bring it to a boil and then simmer for hours until the veggies have no flavor. I threw carrots, celery, onions, and garlic into my pot of water and did some writing and book promotion while I waited. I have to tell you, homemade stock is so much better than store-bought. Do you remember when I made risotto? I was convinced it would be terrible because the vegetable stock smelled so bad. It turned out just fine, but I have to admit, I feel so much better using the wonderfully aromatic homemade version. But all that is lead-up for the actual recipe I'm bringing you today... which is not so much a recipe as a set of guidelines. If there are particular herbs you like in your soup, feel free to add. These work for me. Next time I may consider adding a bay leaf or two. Cook the barley by boiling it in water until tender. Drain. Saute the onions and garlic. Add the wine and simmer for about 20 minutes. Add the stock, the mushrooms, the oregano, garlic powder, and rosemary. Allow this to simmer for about an hour or so. Add the barley and simmer for about 15 minutes. Determine whether you need to add more stock. If you do, simmer a little longer until the flavor is strong enough. Serve. This is not a soup that's full of cream or butter so it tastes much lighter and fresher than most barley soups I've tried before. At first sip, I thought it wasn't flavorful enough, but it grew on me quickly and I find myself craving more now. It really is good -- best of all, it *feels* good -- and the little bit we had left over disappeared quickly. My next Manor House Mystery - GRACE INTERRUPTED - comes out in June! Woo-hoo! Getting very excited! If you would like a supply of bookmarks to enjoy and share, please visit my blog here (after 10AM Central time) for more information. While you're there, don't forget to sign up for my newsletter. And if you do, don't forget to complete the final step when you receive the confirmation email. Otherwise, they can't be sent to you! That looks so good! I make a beef, mushroom, and barley soup that everyone here likes. That picture just makes me want to grab a spoon and jab it into my monitor. Or maybe a fork - it looks like it would be a yummy side dish, too, with just a little less liquid. Mmm. Glad I planned to make chicken soup this morning. Your picture is making me hungry! I'm really curious about soaking the barley. I make barley about three times a week, but I've never soaked it. Was it puffed up after soaking that long? Love this wheat-free, dairy-free recipe, Julie. Can't wait to try it. Thanks! I am a huge barley fan and my hubby is a soup fanatic. We'll both be happy! Thanks, Julie, for another excellent vegetarian recipe that even a carnivore like me will enjoy. Christi - you're right, this could make a terrific side dish. Thanks for the idea. Krista - I soaked it because I have an old recipe that I adapted, that instructed me to do so. Hmm... maybe I'll try it without soaking next time. Fewer steps is always best! Erika - Thanks! Hope you enjoy! MJ - We really like the texture of barley. I'm looking forward to making this again soon. 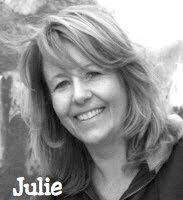 Julie, great recipe. You know I love soup! And as a side dish, yum! Cheers to you for continued healthy eating! Raising (and waving) my hand in agreement on the homemade stock front, too. So easy to make and so delicious compared to pre-made. (I do use store bought when I don't have time, but the homemade version really is easy and better tasting.) Oh, your soup looks delicious. Wish I had a bowl now! Hey Avery and Cleo - I'm planning to whip up another batch next week. You're more than welcome to come share! I love these healthy recipes! This one sounds delicious, especially since I've been on such a mushroom kick lately. Thanks for sharing! This looks like the perfect dish to make for a lazy Saturday!! I have a few veggies inthe fridge that are looking less than lovely...now they will actually be used! Making my first ever batch of stock on your recommendation! Thanks Julie and brava on your healthy eating plan being a success so far! Elizabeth - bring on the mushies! Enjoy! Nanc - It is a perfect weekend dish because you can get so much done while it's simmering. These healthy recipes are fun (so far!). This looks wonderful ... and so much healthier than my mushroom/barley soup recipe (which starts with a quarter cup of butter). To switch things up, my recipe is actually seasoned with a little dill ... it's surprisingly good. I think you'd want to eliminate the other herbs if you went with dill (as dill doesn't really blend with much). But I think next time I make the soup, I'll try your herb combo - that sounds so good!! Ooh... dill. I like that idea. I may try that next time!